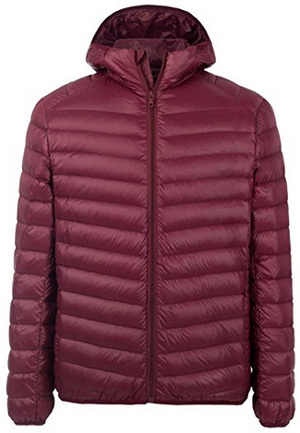 A few days ago we took a look at some down jackets for men, suitable for travelling. Well, this selection is for the ladies. A brief introduction to what we will be looking at is in order. 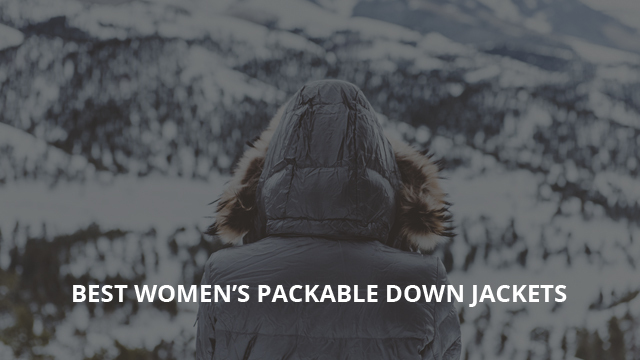 These down jackets are packable, which means less occupied space in your suitcase. A great feature for those looking to travel to cold areas, so there won’t be the need for extra baggage, or leaving other necessary items behind. So that’s the key feature we’ve based our selection on. Let’s take a look! We’re starting off with this casual puffer jacket by Cherry Chick. It is a jacket that not only packs into a small pouch, but it is also ultra light, barely adding any weight to your luggage. The down insulation is a blend of 90% white duck down and 10% feathers. The collar is hooded, which is elasticized to fit better on the head. It comes with a water-resistant main zipper and chin guard on the collar. The sleeves turn inwards at the cuffs and have elastic wrists for a better fit, as well as to help keep the warmth inside the jacket. This is a spacious jacket, with two zip pockets on the outside and two oversized pockets on the inside. A great feature is its thinly spread down, held in place by horizontal stitching. This makes it easy to wear as a layer underneath a thicker winter coat, for those who live up north. It withstands light raining and it is fully insulated, as well as windproof. There are over 50 color options to choose from, some of which include: Burgundy, Black, Rose Red, Moto Dark and Lake Blue. 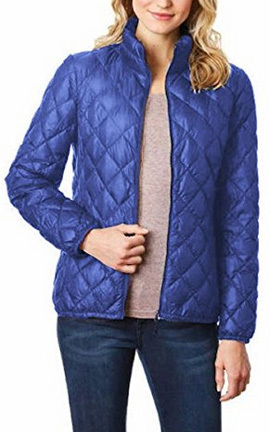 For those who prefer more coverage, this chevron-quilted jacket by Calvin Klein would be right up your alley. It is a hoodless jacket, made of 100% Nylon both inside and out. The funnel collar is high and the oversized sleeves are wide at the ends. However, it is one of the warmest down jackets you will find, especially considering the light weight and the fact that it is not bulky. There are two vertical pockets on the sides, which help keep the hands the warm. This is a versatile jacket, as it can be easily layered underneath, as it is spacious, while also being thin enough to be worn underneath a thicker jacket. A waterproof layer would be recommended if you’re in damp areas, as it isn’t very water-resistant. But nonetheless, it is a very form-flattering and warm jacket, which comes in the colors: Navy, Black and Titanium. It comes with its own color-matching pouch for travel. 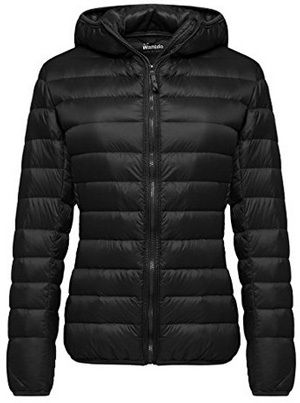 Heat is a 100% Nylon jacket by 32 Degrees, with 90% down and 10% feathers insulation. This is also a hoodless jacket, like the previous one, which comes with diamond quilting. This gives it a very chic and trendy look. This is an option best suited for mild temperatures and preferably dry weather. It holds up nicely in cold days, but we’d recommend putting on a sweater underneath. The sleeve cuffs are elasticized, as is the lower hem, to help make it fit better, while also preventing heat loss. There are two concealed pockets on the sides and it is available in the colors: Black, Purple, Wet Purple, Black Wool, Red, Cloud Cover Tweed and Cloud Tweed. Moving on to Wantdo’s extra slim jacket, right off the bat you will notice the attached hood and the cut waist. It is not only a flattering jacket to wear, but also versatile. You can take it with you on your next trip, as a casual wear or for outdoor activities. The shell is made of 100% Nylon, insulated with 90% down. It is water-resistant and has been coated to also be water-repellent. Apart from that, it is also windproof and with horizontal quilting. Both cuffs, along with the lower hem, are elasticized, making the jacket close off from the outside temperatures and conditions. There are two pockets on the sides, along with inner pockets, which are deep to help you carry your belongings safely. It comes in 7 colors: Black, Khaki, Navy, Sapphire Blue, Wine Red, Acid Blue, Blackish Green. 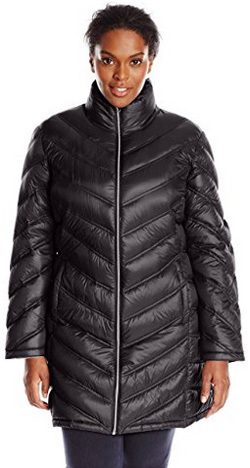 Designed by London Fog this stylish down jacket is made of 100% Nylon. The insulation is 90% down and 10% waterfowl feathers, held in place by mixed quilting. It has a cinched waist that gives it a feminine and elegant silhouette. The high collar is hoodless and zips up, the main zipper being concealed and water-resistant. There are two side pockets on this jacket, along with two inner ones on either side. It is water-resistant and suitable for mild temperatures. The sleeve cuffs are elastic and it is a slim fit, which should be kept in mind for those looking to wear thick sweaters underneath. It comes with its logoed bag for carrying when travelling. There are 2 color options to choose from: Black and Dark Blue. Also by Calvin Klein, this mid-length jacket is a great option for cold and windy days. The outer shell is water-resistant and made of 100% Nylon, while the insulation is held in place with chevron quilting. For rainy days, it comes with an attached hood, with elastic band around to fit properly. The sleeves are wide at the cuffs, however they are warm and insulated, preventing heat-loss. From the front, the cinched waist is not very visible, but it is from the back. The waist is also elastic, making movement easier and allowing some room for layering. There are two zip pockets on the outside, lined to help keep the hands warm. It comes with a pouch for packing and you can find it in 7 colors: Black, Dark Indigo, Granite, Mulberry, Taupe, Wine and Silver. Lastly, Kenneth Cole’s mid-length jacket is a stylish jacket for everyday wear. It goes well with any outfit and it is made of 100% Polyester (down alternative), including the insulation. This means better performance in case it gets wet, as it won’t lose its insulating ability. There is an attached hood and wide cuffs, with a front-opened bottom hem. The waist is cinched and also adjustable with drawstrings, as is the hood. There are two side pockets and it comes with a color-matching pouch. The color selection includes: Clover, Midnight, Nickel, Black and Rum Raisin.